The 4K SUMMIT 2017, which will be held in Malaga from the 8th to the 10th of November, has opened registrations today, 100 days before its inauguration, with important discounts for early birds. The most important change is that the event will be extended to three days (from Wednesday 8th to Friday 10th of November), so that attendees can participate in a larger number of conferences, round-table discussions and more hours of networking, as well to help them to better adapt to the visiting hours of the Demo Area, which is located next to the conference area. The event, which was first celebrated in 2015, has managed to become an international landmark in the Ultra High Definition (UHD) technology and content sectors. It will bring together lecturers, brands and attendees from over 20 countries, who have already set aside the second week of November to attend the 4K Summit in Andalusia. In this thrid edition, the 4K Summit will have Movistar as one of its main sponsors. The president of Telefónica España, Luis Miguel Gilpérez, has already confirmed his participation in the opening session. Gilpérez, a great promoter of 4K within Telefónica, will share his vision of the relevance that this new technology is going to have in the following years for one of the leading telecommunication companies at a global level. Pere Vila, Innovation, Technology and Systems Director at RTVE, will also participate in this new edition. Internationally recognised figures such as Stephan Heimbecher, Innovation Director of Sky Germany, and Hans Hoffman, Head of the Media Fundamentals and Production technology Unit at EBU, are some of the prestigious lecturers who will participate in the 4K SUMMIT 2017. Large multinational technological companies such as Samsung, Eutelsat, Sony, Dolby, Nokia, Panasonic, Fujifilm, Ericsson, Ateme, Akamai, Rohde&Schwartz, etc., are among the sponsors of the 4K Summit. “Over the upcoming weeks, we will settle agreements with other multinational companies that have already expressed their interest in participating in the third edition of the 4K Summit, especially after the meeting we had with them in the NAB in Las Vegas,” assures Ricardo Medina, CEO of Medina Media. 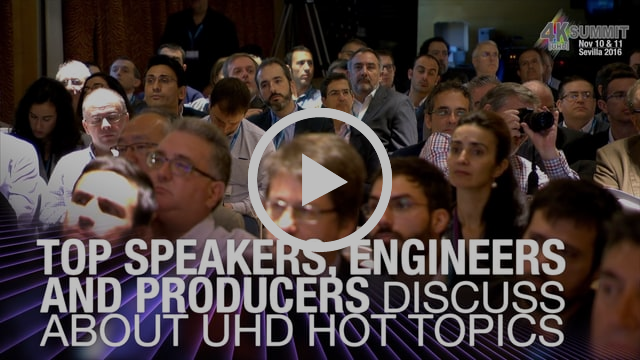 In addition, leading Spanish Ultra High Definition (UHD) companies, including RTVE, Hispasat, Cellnex, Axión, RTVA, Tedial, Ovide, Hurí, etc., will be in Málaga to present their latest projects and innovations. Among the attending public institutions is Extenda, the Andalusian Agency for International Promotion, which will collaborate by inviting globally recognised speakers to help Andalusian companies to better understand the rules of the market, so they are able to succeed around the world. This agreement settled with Extenda allowed them, for example, to bring internationally renowned Ultra High Definition (UHD) experts to Andalusia in the 2016 edition, such as Hans Hoffman (Head Engineer at EBU-UER), and Josh Stinehour (from the Devoncroft Partners American Consulting Company). Medina Medina, the event organiser, came to an agreement with ProMálaga in March, to hold the third edition of this international forum in the capital of the Costa del Sol. This also meant that the Polo de Contenidos Digitales of Málaga would become one of the promoters of the 4K Summit, whose first two editions were held in Seville. The deal is part of the municipal company PromMálaga’s commitment to turn the capital of the Costa del Sol into a pioneering city in the field of New Technologies in the South of Europe. The Polo de Contenidos Digitales, which was opened barely two months ago, already hosted the first edition of the Observatory of Virtual Reality (www.observatoriovr.com), also organised by Medina Media, on the 19th and 20th of July. The 4K Summit agenda will be published over the next few weeks. All the conferences are in English, but this year the organisation will offer a simultaneous translation service for the attendees.